Joseph Foster, Alumni Oxonienses 1500-1714 (1891). 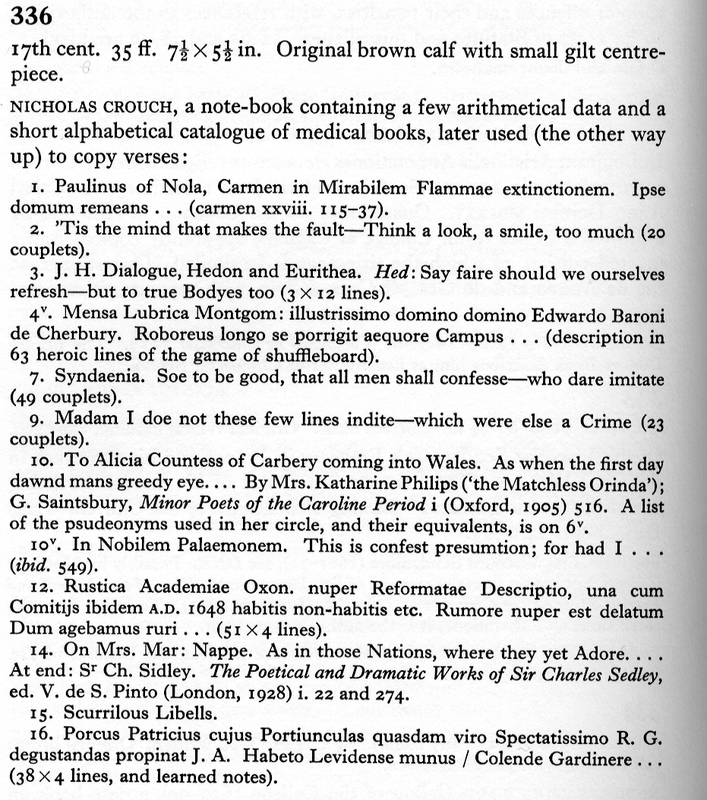 Foster refers the reader to [Montagu] Burrows, Register of the Visitors of the University of Oxford 1647-58 . John Jones, Balliol College : A History. 2nd ed.rev. Oxford: OUP, 2005. Born c.1618, son of Nicholas, of Falldoe [Faldo, now Faldo Farm] in the parish of Highham [Higham Gobion], Bedfordshire. The Crouch family held the manor of Westhey and Faldo for part of the 17th century; see 'Parishes: Higham Gobion', in A History of the County of Bedford: Volume 2, ed. William Page (London, 1908), pp. 344-347. British History Online http://www.british-history.ac.uk/vch/beds/vol2/pp344-347 [accessed 1 April 2016]. Education : Matriculated Balliol College 5 December 1634, aged 16; B.A. 2 June 1638; M.A. 16 December 1641. Career : Fellow of Balliol from 1640. Foster claims that he was ejected from his fellowship in 1648, but Jones (p.107) narrates that he slipped away from Oxford in 1645, but came back in 1649, and Clark lists him as a Fellow until his death in 1690. Died c.1690 (on 23 July 1690, and was buried in Balliol chapel, according to Clark's lists). Will proved 28 July 1690. He made bequests to Balliol [see transcript of his will, College Archive MISC 30.13].